Whatever your business or personal situation, the lawyers at Hager, Dewick & Zuengler, S.C. always put you—our client—first. The relationships we’ve built throughout the years all began by listening and understanding each client’s needs and concerns. Then, we use our expertise to deliver insightful legal services throughout Green Bay and the communities we serve in Northeast Wisconsin. Hager, Dewick & Zuengler is Green Bay and Northeast Wisconsin’s choice for trusted counsel. A reliable mergers and acquisitions lawyer is critical for a smooth transition. Early in the process, we immerse ourselves in your transaction and examine how the smallest details will impact each aspect of your business. When you need an experienced m&a lawyer in Green Bay and Northeast Wisconsin, look first to HDZ. If you, or someone you love, requires trust administration or probate administration, it’s important to have an experienced probate lawyer on your side. We honor a legacy while ensuring beneficiaries quickly and smoothly receive their share of the estate. In cases when a civil litigation lawyer is needed, HDZ’s experience is invaluable. With so many business law attorneys available, making this important decision may be difficult. You want a corporate law attorney who is dedicated to protecting your business and your livelihood. Do you need business succession planning, a commercial real estate lawyer, employment law insight, or a business litigation attorney? HDZ navigates today’s legal and business obstacles and helps you move forward. You’ve worked so hard. We honor that lifetime of dedication by helping preserve your wishes and your wealth. When you want a caring and seasoned estate planning attorney, a financial power of attorney, or even a residential real estate attorney, call HDZ. We believe that peace of mind is priceless. When it comes to a lawsuit, the importance of experience cannot be emphasized enough. HDZ is your source when you need a seasoned business litigation attorney or a tested civil litigation lawyer in Green Bay or Northeast Wisconsin. 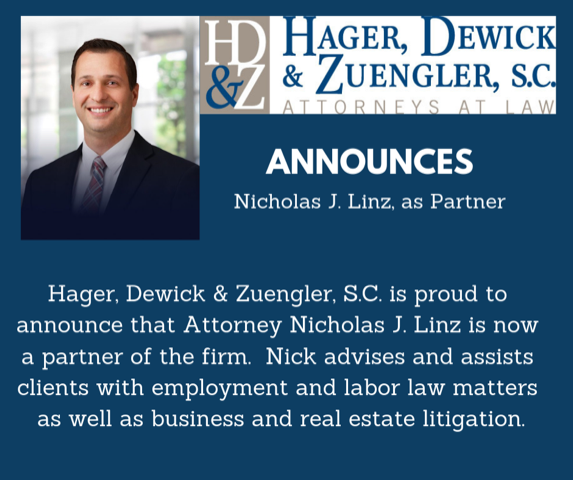 We have worked closely with Hager, Dewick & Zuengler, S.C. for a number of years. They are always prompt with their response to us, giving us a clear understanding of where we stand. This is essential when operating a business and needing to make informed decisions. We have appreciated the personal relationship that they have built with us, and have recommended their services whenever asked. – Rich Otradovec, RODAC, LLC. In the years we have worked with Hager, Dewick & Zuengler, S.C. they have provided great service and response time. They always recommend additional steps we can take to protect the company long term. They have also provided various legal services for us beyond just corporate law, but also advice and counsel in the areas of employment law, contract law and real estate law. Jeff Shefchik, Paper Transport, Inc.
We have worked with HDZ on several trust and estate matters for our families over the years. Their ability to combine technical expertise while explaining matters in plain English and their sincere compassion for the needs of our families truly sets them apart in the estate planning community. We gladly refer HDZ to family and friends without hesitation.